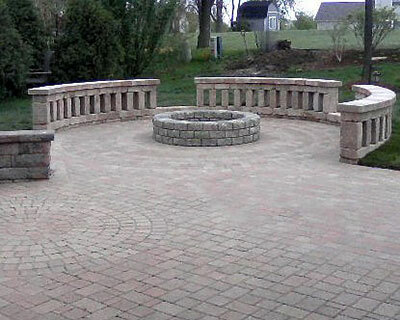 If you want to have awesome paver features and amenities in your property, hire Rob Rocks Inc today. We are a locally based hardscaping company that specializes in all types of paver installations. All our works are designed and built by experienced and highly skilled crews. In fact, most of the beautiful paver amenities in the areas we serve are our creations. We have installed numerous elegant paver patios, attractive pool decks, durable paver driveways, and other excellently designed paver features for clients in Bolingbrook, Naperville, Aurora, Plainfield, Yorkville, Lockport and Orland Park, IL. Please call us today so we can start discussing your outdoor improvement project. We offer free consultation to give you a better idea of how we handle projects that involve paver installations. At Rob Rocks Inc, we make sure that we have the best people in our company. We employ only those who are skilled, experienced, and committed to adhere to our company's principles and objectives. We also look at their portfolios of completed projects to ensure that they can provide our clients with outstanding paver amenities. With our adherence to high quality standards, clients from Yorkville and other IL cities that we serve can expect professionally designed paver installations. Each paver feature that we work on is carefully designed and built using the finest materials. We never settle for mediocre results or use substandard materials just to earn more dollars. When you hire us, you are assured of quality workmanship that only an experienced contractor can provide. At Rob Rocks Inc, we help clients make sound decisions by helping them choose the perfect paver features and amenities that will suit their needs and preferences. Before we start a project, we first sit down with clients and ask about their needs. We also conduct an onsite visit to have a better understanding of the needs and capacity of the outdoor area. With this approach, we can easily come up with the right design that will make our clients happy. Paver patios. Pavers are the best materials to use for patio installation. With the wide range of available designs, patterns, and colors, we can easily achieve your desired look or theme. A paver patio will not only improve the aesthetic appeal of the outdoor area but also provide additional living space. Paver driveways. Most of our paver installations involve installing paver driveways. We follow efficient methods and use premium pavers to ensure the durability and beauty of the driveways that we create. You can visit some of our completed projects in Yorkville and nearby areas to see first-hand the quality of our driveways. Paver pool decks. We use slip-resistant pavers when building pool decks for clients. They are carefully designed to improve the aesthetics and functionality of the pool area. We can also add other amenities to make it the best spot for rest and relaxation. Call Rob Rocks Inc today and let us design and build all the paver installations in your property. Rest assured that we will build these features at affordable rates. Dial 630-742-4996.